Medieval Town Mandala - So Behind! I started this late - back in May, when the rest of the group started last October. Right now, I'm working on Part 3 of 12. I really like the way this is turning out - each piece is so much more detailed than the overall picture. It's with silk, too, so I love the feel. The tons of Treasure Braid in Part 2 (the golden outline) were a pain to work with. They twist a lot, but the effect is worth the pain. Since my husband took this picture, I've finished the backstitching for the flowers around the outside. Decided it was good to do them so I can place the butterflies more accurately - they're all over one. Okay, so I'm behind on this. I'm still working on Part 1 and Part 3 comes out day after tomorrow. It's going well, I'm just slow. The fibers are all Martina Weber's recommended ones, but I've made the background a dark grey. I've come to love working with silk. It's very hard for me to go back to plain old DMC for projects anymore, despite silk being more expensive. Maybe I'll start catching up more as this project goes on. There are six parts and each part is released on the first of the month. Wish me luck! 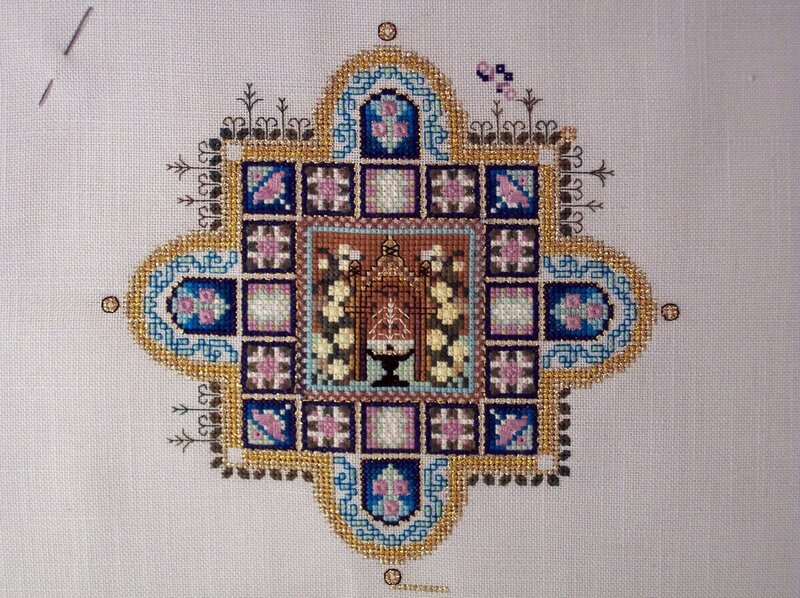 My friend Lynne, who I'm working on this with, is a lot farther along than me, but then - she has fewer projects at a time. I believe she's almost done with Part 2. Will see it when she comes to visit overnight tomorrow. If you like detailed, eye-popping work, I recommend doing some of the designs from Chatelaine. I've become a real fan. This piece is a Group Correspondence Course from EGA. 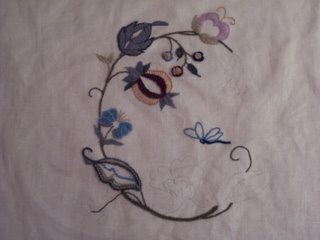 It's my first attempt at crewel in over 20 years. Some parts I think look okay, and other parts are wretched. I've learned a lot about working with wool, though, like the fluff factor. It also feels really weird not counting the stitches, but putting them in where you think they look good. As you can see, I have only four major elements to go. The colors - are not the original colors and not colors I would have chosen for myself. I ordered the kit from Jenny June back in April? March? and it came with these colors, though I swear they're not the ones that were in the picture. Probably this will end up being either a "gift to relative" project or a cushion in the house somewhere. Either way, it's a learning experience. My husband took my pictures early - this is one of them. I started this about a week and a half ago. The colors are all changed. Black Congress cloth, Needle Necessities red, and the rest are Splendor. My daughter saw the original picture on the cover of the leaflet and loved it, so I had her pick the colors. She picked the Needle Necessities color and the black background. I did the rest. This one's going pretty quickly. 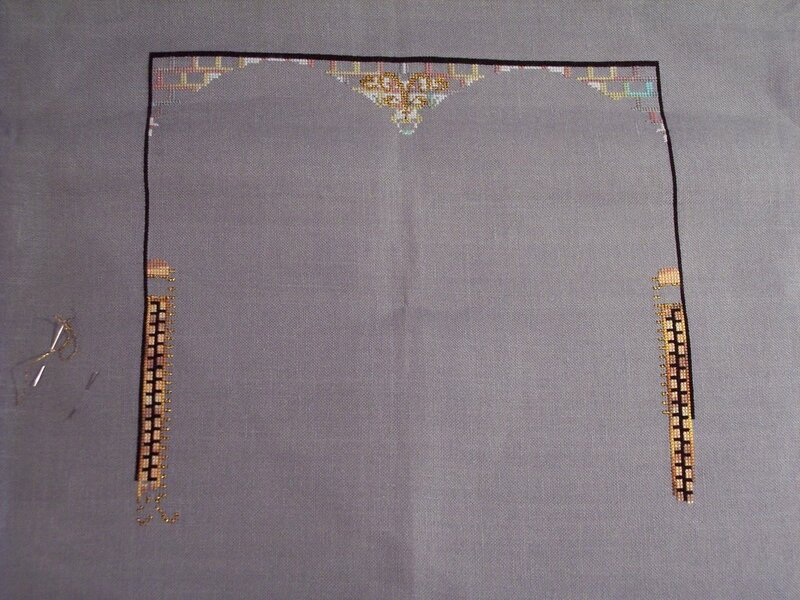 I have only one more row of the top motif to add, then can start the other motifs. Hopefully I'll have this done in another month to six weeks. I know a lot of stitchers out there do their work in blocks of time. My question for them is how do you measure your time on a piece? Me - I've never been able to. 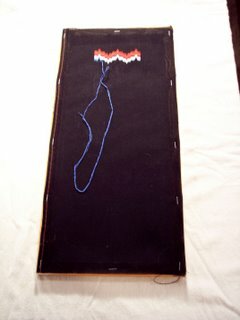 I first started stitching heavily when my children were at the ice rink six days a week, six to seven hours a day. I needed something to do to keep my hands busy and to keep me from feeling I was wasting my time every day. Enter stitching projects. Pick them up, put them down, pick them up ... you get the idea. How do you measure that kind of time? You don't. That is still, despite my skaters being grown, how I stitch. Pick it up, do one to a hundred stitches, put it down. So, instead of rotating works in progress by time, I rotate them by amount of floss used. I thread the needle, stitch the floss length, and go to the next project. One advantage of this system is that you are constantly making progress on all of your works in progress. Weird, I know, but it works for me. On Thursday, I'll post my current works in progress as pictures. Will try to take a new picture every week. That way I can tell I'm making progress, too. 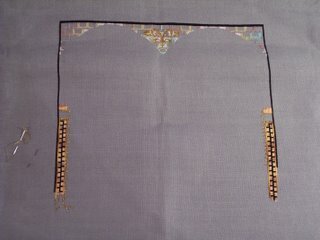 Well, I decided to write this blog because I keep thinking I've made too many commitments on stitching. There are just too many things to be interested in and too many things to do! 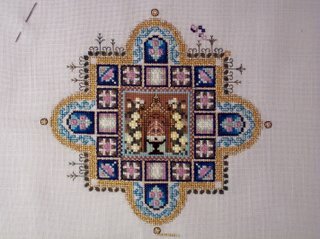 Currently, I'm signed up for three Martina Weber (chatelaine.net) online classes - MidiMystery II, Medieval Town Mandala, and Persian Iris Garden. I'm actively working on two of them. I also am signed up for -several- Group Correspondence Courses through EGA (egausa.org), took over my local EGA Chapter's newsletter, and have ornaments to do for Christmas and other things to finish up for friends. So, I'm committed. Whether to stitching or an insane asylum, I'll let you decide.